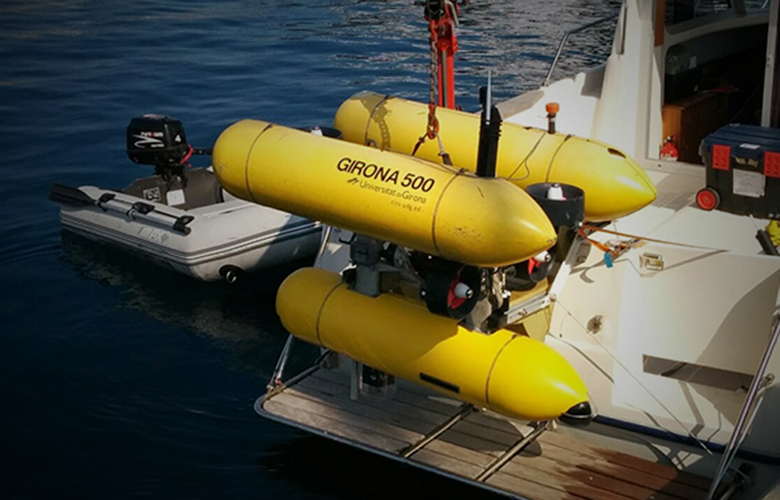 The Girona 500 is a reconfigurable autonomous underwater vehicle (AUV) designed for a maximum operating depth of up to 500 m. The vehicle is composed of an aluminium frame which supports three torpedo-shaped hulls of 0.3 m in diameter and 1.5 m in length as well as other elements like the thrusters. This design offers a good hydrodynamic performance and a large space for housing the equipments while maintaining a compact size which allows to operate the vehicle from small boats. The overall dimensions of the vehicle are 1 m in height, 1 m in width, 1.5 m in length and a weight of less than 200 Kg. The two upper hulls, which contain the flotation foam and the electronics housing, are positively buoyant, while the lower one contains the more heavy elements such as the batteries and the payload. This particular arrangement of the components makes the separation between the centre of gravity and the centre of buoyancy about 11 cm, which is significantly more than any typical torpedo shape design. This provides the vehicle with passive stability in pitch and roll, making it suitable for imaging surveys. The most remarkable characteristic of the Girona 500 is its capacity to reconfigure for different tasks. 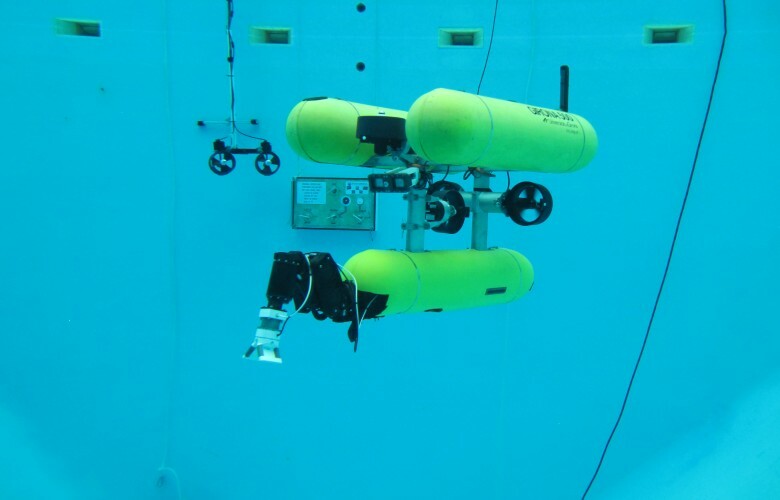 On its standard configuration, the vehicle is equipped with typical navigation sensors (DVL, AHRS, pressure gauge and USBL) and a basic survey equipment (profiler sonar, side scan sonar, video camera and sound velocity sensor). In addition to these sensors, almost half the volume of the lower hull is reserved for mission-specific payload such as a stereo imaging system or an electric arm for manipulation tasks. The same philosophy has been applied to the propulsion system. The basic configuration has 4 thrusters, two vertical to actuate the heave and pitch and two horizontal for the yaw and surge. However, it is possible to reconfigure the vehicle to operate with only 3 thrusters (one vertical and two horizontal) and with up to 8 thrusters to control all the degrees of freedom.